1) The strong buyer momentum from the 1Q2017 carried over into the 2Q2017 as closed sales increased 16% from the prior year and sellers conceded to average price reductions of 6.1% across all property types. 2) Properties that sold in the 2Q2017 spent on average 108 days on market vs. 89 days in the same period last year. 3) Luxury homes, defined as the top 10% of deals by price were listed for 231 days on market vs. 169 days in the 2Q2016; sellers experienced price cuts on average of 10%. 4) The rising stock market post U.S. presidential election in November gave buyers the confidence they needed to re-enter the market after a long pause in the second half of last year and move forward to snap up inventory that had been lingering on the market. Sellers finally gave in to the uptick in buyer demand with discounts in order to close transactions. 5) The 2Q2017 sales increase was the biggest since the 1Q2015, when deal volume surged 22%. The median price of resales in the 2Q2017 climbed 3.2% from the prior year to $975,000, while the luxury median price rose 3.5% to $6.84 million. 6) Despite the increase in closed transactions, signed contracts to purchase homes fell 8% in the 2Q2017 from a year earlier to 3,258, reflecting in part the high price of remaining inventory. The frenetic purchase activity of 2014/2015 has all but disappeared; buyers have no sense of urgency and realize that they have abundant options in most price segments and submarkets. 1) Contracts for co-ops, condos and townhouses priced at $4 million or more are up 18% in 2017 through mid-May, compared with the same period in 2016. The 539 transactions resulted only after sellers discounted prices by 8% on average. 2) Approximately 4,282 new development condo apartments are expected to be listed this year in addition to normal resale inventory to come online. 3) Close to 25% of all luxury contracts signed this year were for co-ops with new development condos comprising a large portion of the remaining 75% (townhouses accounted for only 39 of the contracts, the lowest total for the period since 2013). 4) New development condo purchases continue to be in favor as buyers prefer newer properties with more amenities and less restrictive ownership rules. In addition, a lot of the new development luxury condo inventory is located in sought after Downtown neighborhoods. 1) The number of available apartments in new developments rose 35% in the 2Q2017 compared to the same period in the prior year. 2) New development available inventory totals 5,936 units, including both listed units and shadow inventory (listings available, but not yet released). 3) The rise in inventory is attributable to a slowdown in sales at some developments, especially among the most expensive apartments where there has been a pull back from ultra-wealthy buyers. 4) In the 2Q2017, contracts were signed on more than 350 apartments, down 23% from 2Q2016. 5) In all, just over 2,600 condos are due to come on market during 2017, compared with 2,457 in 2016 (In 2006, a peak year for new condos, nearly 9,200 came on market). 6) The opposite dynamic prevails in Brooklyn where the inventory of new development condos fell by 28% to 620 units. This reflects in part that developers focused largely on building luxury rental buildings post-recession, resulting in a limited supply of condos. Those developers who opted to build new luxury condos targeted the “affordable luxury” segment of the market ($1,200-$1,500/sf), where there was strong demand, and projects experienced brisk sellouts. 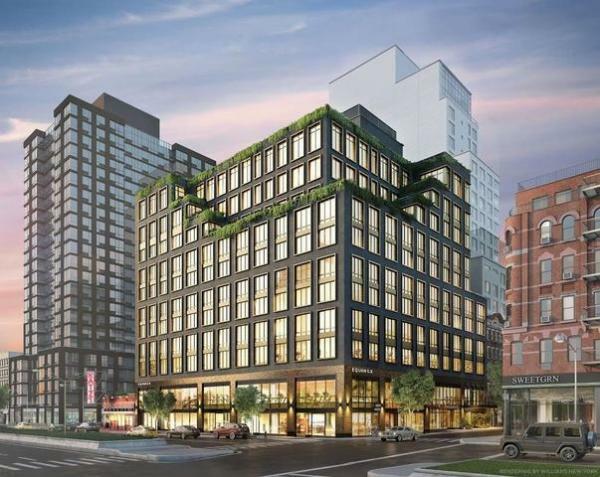 1) 21 East 12th Street, a 23-story luxury new development residential condo building under construction in Greenwich Village, signed $60 million in contracts in May, including the sale of two duplexes to a single buyer listed for a combined $23.5 million. 2) Approximately 65% of the project’s 52 units are in contract. Most buyers are domestic and native New Yorkers; many already living in the neighborhood. 3) About 4,282 new development units are expected to be offered for sale in Manhattan this year, almost double the amount listed in 2016. More than 60% are considered luxury costing at least $2,400/sf. 4) This year through mid-May, more luxury home contracts were signed for purchases south of 34th Street than any other area in Manhattan. 5) A host of new luxury developments in West Chelsea, the West Village, NoMad, Flatiron District, Tribeca, Soho, the Lower East Side and the Financial District are attracting primarily local buyers from Uptown. 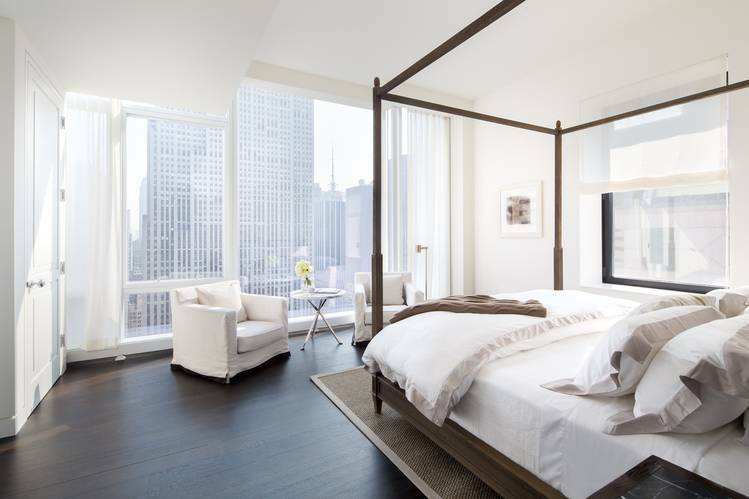 6) A penthouse listed for $65 million at 70 Vestry, a luxury new development in Tribeca (more than 80% of the 42-units have been sold), went into contract last month. The sale when it closes will set a new record for downtown Manhattan, topping a $50.9 million sale at Chelsea’s Walker Tower. 1) Given the oversupply of ultra-luxury condo apartments priced at $10 million+, developers are now focusing on smaller and less expensive units priced under $5 million. 2) In the first four months of 2017, the average accepted unit price to come on market was $3.1 million down 42% from $5 million in 2015. 3) A majority of the new developments coming online this year are targeting a mid-market price-point between $1,800 and $2,400/sf (vs. $3,000-$5,000/sf in years past). 4) During the most recent development cycle (2012-2016), developers largely neglected the “affordable luxury” ($1 million-$4 million) market segment. Buyers in search of this price point ($1,200-$1,500/sf), for the most part, bypassed Manhattan for Brooklyn and purchased at such new developments as The Boerum, 51 Jay Street, 465 Pacific, The Oosten, 280 St. Marks Avenue and 345 Carroll Street. 1) The median Brooklyn home sales price rose to a record high of $760,000 in 2Q2017, a 27% increase over the same period in the prior year. 2) The average sales price increased by 24% to $937,000 during the same period. Purchasers agreed to pay more than what sellers were seeking in 23% of closed transactions. 3) The number of closed sales increased 17% in 2Q2017 vs. a year ago. The number of new development closings doubled from 2Q2016. 4) Brooklyn’s sales inventory of 2,257 homes at the end of 2Q2017 was the lowest for the period in nine years. 5) Three-bedroom plus homes experienced the largest gain in median price, increasing 19% year-over-year to $1.83 million. 6) In the area that includes Brooklyn Heights, Cobble Hill, Dumbo and Downtown Brooklyn, the median price of completed deals climbed 24% to $1.24 million. 7) New development condos had a 41.2% market share of all condo sales in Brooklyn, an increase from 23.6% in 2016. 8) The strength of the Brooklyn market, validated by the metrics noted, reinforces the trend that buyers are looking for an alternative to the high price tag of purchasing in Manhattan. 1) The triplex penthouse at the clock tower building in Dumbo sold for $15 million in late March, setting a new threshold for luxury property sales in Brooklyn. 2) Other recent noteworthy sales include a $10.67 million condo at Pierhouse and before that, the $8.1 million penthouse at 1 John Street in October 2016. 3) The number of sales above $3 million tripled between 2015 and 2016, when 101 properties closed for over $3 million compared to just 34 in 2015. There are currently about 40 active listings north of $3 million. 4) Luxury New Developments with contracts signed or recently sold units priced north of $3 million include The Standish, 51 Jay Street, 200 Water Street, Polhemus Residences, The Boerum and The Hendrik. 5) A more affluent population along with their creative companies are crossing the bridge from Manhattan to Brooklyn and driving the demand for these luxury residences. This buyer pool is in search of more space and value compared to what they can purchase in Manhattan. 1) The median sales price for a single family home in the Hamptons rose 7.5% to a record $1.07 million in the 2Q2017. 2) Sales of single family homes jumped 26% in the 2Q2017 to 674 from the same period in the prior year. The number of for sale listings fell 4.1%, depleting available inventory. 3) Despite the increase in demand driven by a record high stock market and strong Wall Street bonus season, buyers held firm and 86% of all purchases traded at an average discount of 12% below the last asking price. 4) The second quarter’s most expensive transaction was a $31 million purchase of a four-bedroom oceanfront home at 328 Gin Lane in Southampton. 1) The New York metropolitan area remains the most attractive urban location for the world’s ultra-rich, attracting 8,350 residents with a net worth of at least $30 million in 2016. 2) Hong Kong and Tokyo remained the second and third most popular global cities for the ultra-rich; London and Paris ranked fifth and sixth, respectively. 3) Worldwide, the ultra-rich population grew by 3.5% to 226,450 in 2016, representing a strong rebound from last year’s sharp fall of 7.1%. 4) The strong U.S. dollar was a major factor lifting North America as the top destination for ultra-high net worth individuals. There were 81,700 people with a net worth of $30 million or more in 2016, a 5.1% increase from a year ago. Their combined fortune, $9.633 billion, accounted for 35.6% of all global wealth. 1) In “Magnetic City: A Walking Companion to New York”, New York Magazine Architecture critic, Justin Davidson provides insight to the transformation of NYC since the 70’s. His book focuses on the renaissance of eight areas that demonstrate NYC’s resilience and ability to re-invent itself: The Financial District, the Seaport, the Brooklyn waterfront, the World Trade Center, West Chelsea and the High Line, 42nd Street, the Upper West Side, Upper Manhattan and the South Bronx. 2) I arrived in NYC after graduating from college in 1982, lived in Murray Hill and the Upper East Side and now downtown-in Tribeca/North Battery Park City for the past 14 years. It’s amazing how Lower Manhattan has bounced back since the tragedy of 9/11. We have all witnessed a major reshaping of New York City neighborhoods post-recession 2008/2009 fueled by the most recent real estate development boom during 2012-2016. NYC’s once gritty downtown neighborhoods have all gotten a glossy makeover. Residential Real Estate Advisor. Real Time Market Analysis. THIS WEB SITE IS NOT THE OFFICIAL WEB SITE OF COMPASS. COMPASS DOES NOT MAKE ANY REPRESENTATION OR WARRANTY REGARDING ANY INFORMATION, INCLUDING WITHOUT LIMITATION ITS ACCURACY OR COMPLETENESS, CONTAINED ON THIS WEB SITE.